With our technology, we want to improve the quality of your life beyond what you believe is possible. We know that your smile is your logo, your personality is your business card, and how you leave others feeling after an experience with you becomes your trademark. Give us the opportunity to affect your life beyond compare. We at Laser Healing Therapy are committed to giving you relief from the chronic pain that has plagued you. Personally, we are on a mission. We want everybody to know the benefits of laser healing therapy. Peripheral Neuropathy is our main focus here, and our patients are both amazed and relieved at the results that they achieve. We help them say NO to surgery, NO to pain medication and NO to their consistent, debilitating discomfort and pain. Find out what Laser Healing Therapy can do for you. Contact us now to learn more. Barry Boyce, our Founder and Head Laser Therapist, with many years now in cutting-edge laser therapy, after receiving his Bachelor of Science from Washington and Lee University. 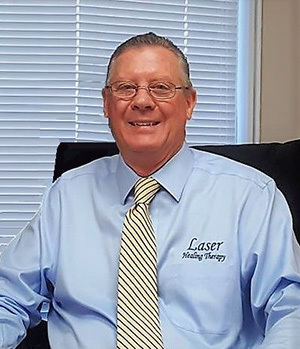 Now with four lasers in use at his clinic, Barry looks forward to meeting you in-person and discussing the best options for you to live a pain-free life. 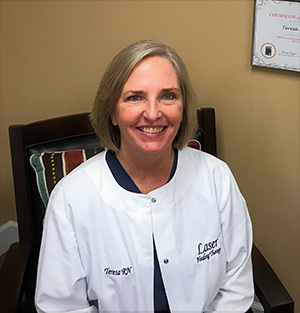 Teresa Smith, Registered Nurse, has worked with our patients here for over two years to help them lessen their pain and decrease their healing time by utilizing our broad beam lasers to help stimulate their bodies’ natural healing process. She enjoys helping our patients learn more about what we do and how it can be life-changing for so many. 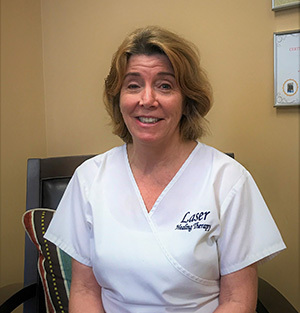 Melinda Linebarier, Registered Nurse, is in her second year on-staff with us and enjoys meeting new people every day and explaining the benefits that our four lasers help our patients with. It all starts with a new patient hearing about us, reaching out by phone or email, and then coming in to learn more from people here like Melinda. Laser healing is not an entirely new process, though it may sound unfamiliar. Low level laser therapy is now termed “photobiomodulation”. For extensive clinical research, or if you want to read more CLICK HERE to go to the National Library of Medicine at PubMed.gov for more articles dated 2014 and after. Shortly after lasers were discovered in the 1960’s, science began discovering more and more amazing purposes that lasers could accommodate. Drug-free pain therapy is now one, and one of the major new treatment options for both pain and healing assistance in medicine today. Laser therapy has been used for wound healing and reducing pain and for inflammation and swelling for years in millions of cases worldwide. Laser healing promotes healthy, natural healing of damaged cells by inducing a photochemical reaction that ignites the healing process, known as Photobiomodulation. Just like the sun’s rays spark growth and healing in all earth’s organisms (ourselves included), the concentrated presence of light of our laser, and the energy that is contained within, can be used to promote healing in specific areas of our bodies that have sustained damage. However, the first step for YOU though, is to meet with us and talk about your particular issues and any past efforts to address those. Please simply reach out to us now and book your complimentary consultation appointment here with Barry Boyce and our staff of Registered Nurses. © 2019 Laser Healing Therapy. All rights reserved.